Will opioid crisis raise red flags for long-term antidepressant use? Even as the nation enters an even scarier phase in its battle against the raging opioid abuse epidemic, new and sterner warnings are flying about antidepressants. The costs of these powerful drugs add up, as does the toll of depression and its care. Users say antidepressants are a nightmare to get off of. And medical experts cast growing doubt about whether their benefits outweigh their risks. Users who try to wean themselves from the drugs find themselves, fast, in nasty situations with “dizziness, nausea, headache and paresthesia — electric-shock sensations in the brain that many people call brain zaps,” patients told the New York Times. 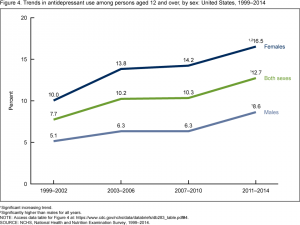 Indeed, Big Pharma, physicians, hospitals, and mental health experts long have known about antidepressants’ less-discussed addictive qualities, including the crash that users can experience in which the very afflictions the drugs aim to remedy — especially dark hopelessness and lethargy — boomerang back on users if they cut back or cut off the medications. Physicians, especially those specializing in mental health care, warn patients against acting on their own to lessen their antidepressant use, which they caution needs to be closely monitored and supervised, as well as done, not drastically, but slowly over time. Frazzled patients, however, may make poor dosage decisions themselves because they and experts agree there is yet another less-discussed down-side to antidepressants: After long periods of use, years sometimes, patients may abruptly find a specific one of these medications may cease to work at all for them. This may set them off on a terrifying quest to find an alternative, with intervening weeks of sadness, hopelessness, despair, and even thoughts of suicide haunting them. The New York Times notes that research shows that patients experience real and dramatic reactions to antidepressant withdrawal and failure — this isn’t a placebo or fake woe. 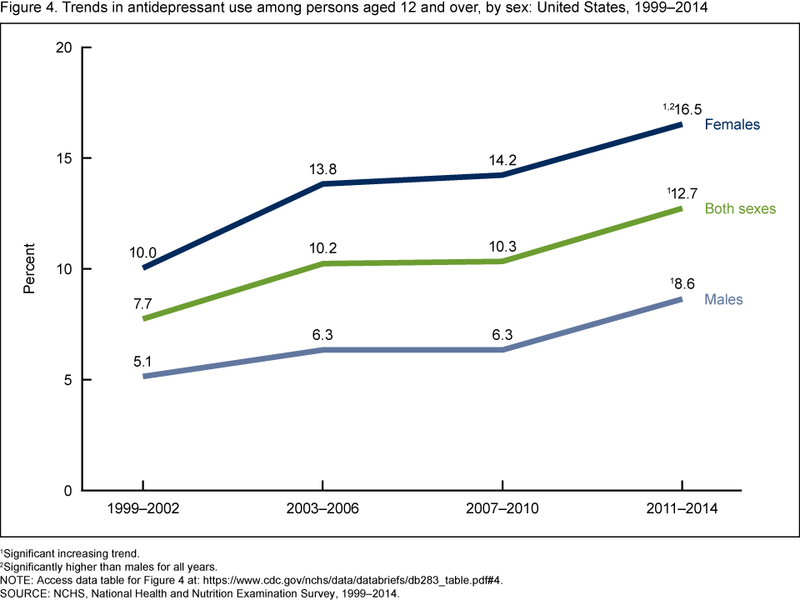 But what may be a sadder part of this whole story is this: Antidepressants, though they may work well for some, over all, offer “modest benefits,” notably in the short-term, and their value may decline in longer consideration, especially given their risks and problems. This conclusion was reported anew recently by Aaron E. Carroll, a physician and a professor of pediatrics at Indiana University School of Medicine. He’s a contributor to the New York Times’ research- and data-driven column, “The Upshot,” and he blogs on health research and policy. With the depressed desperate for relief, are doctors and mental health caregivers too quick to dispense pills and too shy to tell patients the full story about antidepressants? The Cut, a web site that says it wants to appeal to “women with stylish minds,” has posted a story worth a read on antidepressants, because it raises issues about stigma, medication, and mental health. Patients quotes in the piece ask a good question: Do they have a chronic condition for which antidepressants should be akin to, say, taking regular insulin for diabetes? Is the mere notion of taking a psychiatric drug, long term, something to be ashamed of? Probably not. In my practice, I see the harms that patients suffer while seeking medical services, and I know that society at large can demean the hurt, sick, and disabled. Americans can stigmatize those with mental illness in downright cruel fashion. But I also see in my practice the major injuries that can be inflicted on patients by dangerous drugs, including risky anti-depressants. These drugs have come under fire when used in teenagers, based on dubious data. It’s crucial, as the New York Times and Cut stories make clear, that doctors prescribing antidepressants fulfill their duty to provide their patients’ informed consent about these drugs. Patients have the fundamental right to be fully informed about what will or won’t happen to them and their bodies, and, based on complete and comprehensible information, to make intelligent decisions about their medical care. This is just as true about care for the mind as the body. It is unacceptable that doctors might give desperate patients an antidepressant with fuzzy information on how long they might need it — more than a few days, weeks, or even months but rather for years. How, too, can they not explain that the course of care with the drugs will be bumpy, maybe even ineffective? Truth telling isn’t something that should be taken lightly, as the nation is learning in the opioid carnage caused by falsehood and bad conduct by Big Pharma, doctors, hospitals, insurers, and others. New research suggests this epidemic of abuse and overdose deaths grows graver by the day, and that it moved in a sequence of sorts. Prescription painkillers — which Big Pharma and feckless doctors and hospitals — rained down on patients, families, communities, states, and whole regions of the country served as an addiction gateway. It now has opened the way for criminals and other bad actors to flood the nation with illicit, synthetic opioids like fentanyl and street drugs like heroin. So, opioid prescriptions may be waning, but a tsunami of ever more evil drugs washes over the nation, becoming the leading killer of Americans younger than 50. It’s vital that we see how we got into this mess, to avoid others, and to get out of our opioid crisis.